In my quest for the best burger in San Francisco, one stood above the rest: the veggie burger at Roam Artisan Burgers. Please hold your gasp. I am fully aware that it is not “fair” to compare a veggie patty to a meat patty, but let me explain why I loved this burger so much. First, most veggie burgers are frozen before cooking and so dry. This burger was made-to-order and therefore, incredibly moist. The thickness of the patty also lended to its “meatiness”. It has a base of quinoa, brown rice and black beans, but dates are the secret ingredient, giving it the slightest touch of sweetness. 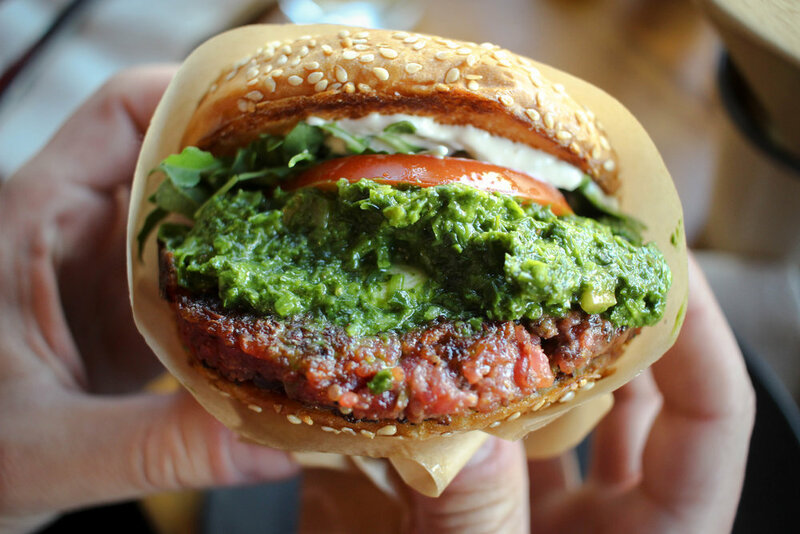 This summer veggie burger was topped off with fresh mozzarella, tomato, and housemade chimichurri sauce. The thick layer of chimichurri- a pungent green sauce made of parsley, minced garlic, olive oil, oregano - launched itself from the sesame buns. Truthfully, you can’t go wrong with the burgers at Roam: they are all winners here. For example, the Sunny Side Burger with bison meat and an organic free-range egg, fontina cheese, caramelized onions, greens, tomato, and chili sauce is another great option. It’s so good that you won’t want to share even one bite. If you go to Roam, don’t pass up on the sweet potato fries. If you are tantalized by the zucchini onion haystack and truffle russet fries, you can also just order the “fry-fecta” and get a sampling of all three. If you are out in the Fillmore neighborhood and looking for a satisfying and hearty bite to eat that won’t break the bank, roam over to Roam Burgers.